Let's Play Music with Ms. Jen? "I am so excited for my two daughters and everything they are learning in their Let's Play Music class. They enjoy every class and I can see how cleverly the curriculum was designed to keep their attention, make it fun and yet teach them such fundamental music concepts. I see them grow every week and I cannot wait to see the progress they'll make at the end of the three years. I am so inspired by the class that I am going to take music lessons myself, with my girls after they finish the 3-year program." 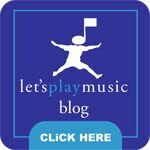 "[Let’s Play Music] has been a great experience for my six year old son. He's really enjoyed all the learning activities in class and at home. In a busy life, it also makes for some special "Mommy and Me" time as we practice his lessons together. He is always very excited to show family and friends the things he's learning at LPM and I'm always thrilled to see how excited he is about it. It's a great foundation in for many aspects in music." "I love that Let's Play Music teaches all of the theory behind learning to play the piano. As a young child I could play all of the songs in the [Yellow Indians] book, but I did not have the understanding that my son has at this stage of learning. It has been amazing!" "I have loved my daughter being a part of LPM. We both love it! Homework is something she looks forward to, because it's time that I focus just on my oldest daughter." "We still talk about you being our piano teacher!!! We loved you! Well, I am completely OBSESSED with music now... I can't get off our piano!! I just wanted to let you know that I didn't quit piano or violin and it was all because of you! Thank you for your time and for your lessons because I wouldn't be where I am today!" I never got a chance to tell you what an awesome part of my life you were. You taught me everything I know and were such an awesome, awesome teacher. I compare all my music teachers to you and no one has come close...but I will continue my search nevertheless! Now I have my own students and learned how to be a great teacher from you. I really appreciate everything you did for me." Are you a current parent and don't see your testimonial? Click the "Raise Your Voice" link to the right and fill out the form. If your testimonial is published on the corporate website, you will receive $10 off one month of tuition! **P.S. : "Raise Your Voice" submissions go directly to corporate. I do not see them at all unless it is published on the corporate website, so if you want me to see your love (and you want to see it here on my blog), click the "share the love" button to the left and send it my way too! :) Thanks! Teach Private Piano Lessons? Click Here! All images and or logos copyright Let's Play Music 2011. Powered by Blogger.